Although few people want to find centipedes or millipedes in their homes, neither of these bugs cause damage or disease, or breed indoors. Because they usually just wander into homes accidentally, these arthropods are considered to be occasional invaders. Body: Can be as short as 1/4 inch in length or as long as 6 inches. The body is made up of 15 or more segments, all of a similar size. Legs: Centipedes have one pair of legs on each body segment - and they have a lot of body segments (thus their name). The first pair of legs has a set of poison claws, or fangs, which they use to paralyze their prey. The back legs are longer than the others and are used as antennae. Color: Yellowish to dark brown or even reddish green. Food: Feed on small insects, spiders, earthworms, and snails. Movement: Centipedes can move about very quickly on their long legs. When Disturbed: Centipedes will scurry away quickly. Where They Live: Centipedes prefer dark, moist hiding places, such as under stones, boards, sticks, leaves, organic matter outdoors, and in basements and bathrooms indoors. Threat: Centipedes of the U.S. rarely bite, but when they do, it can redden and swell similar to a bee sting. In other areas of the world where centipedes are often larger, their bite can cause a burning pain. Body: Up to 1 1/2 inches long (except the Beauvois species found in Texas that can be up to 4 inches in length). Legs: Millipedes have two pairs of legs on each body segment. Their legs are shorter in relation to the body, so they look more like worms than do the centipedes. Color: Brown to black, rounded body. Food: Organic material and some young plants. Movement: Millipede movement is slower with a wave-like look. When Disturbed: Millipedes will curl into a ball, like pillbugs or sowbugs. Where They Live: Millipedes live primarily on organic materials such as leaves, mulch, and wood chips. Threat: Millipedes do not bite, but may eject a fluid that can irritate skin or eyes, have a foul smell, and cause an allergic reaction in sensitive individuals. In general, these many-legged pests cause no danger or harm to people or pets and are not known to transmit any diseases to humans. They do not damage food, plants, furniture, or buildings as other more harmful pests do, such as cockroaches, rodents, and flies. Because they require moisture and foods such as organic material or insects to survive, millipedes and centipedes will not be able to live for long or reproduce in homes, as they are generally too dry for them. 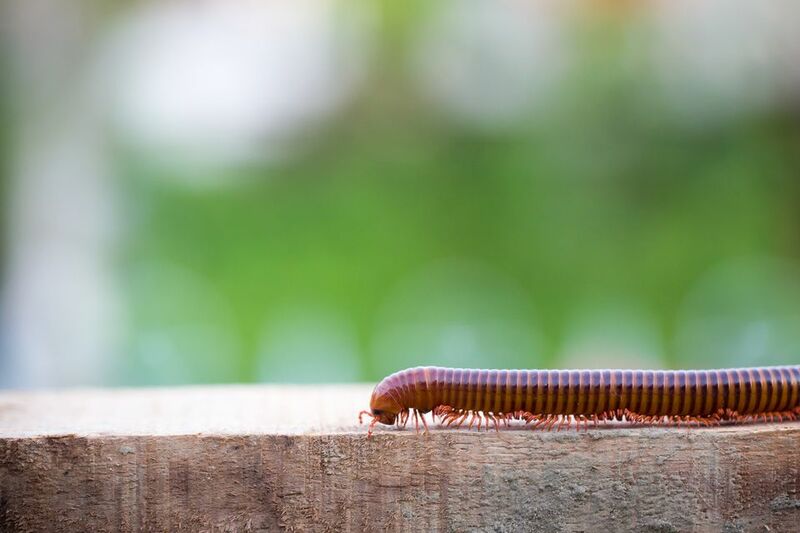 Find the source - centipedes and millipedes need moisture to survive, so if they are living in your home, there may be a moisture problem that should be repaired. Remove any organic material that is within a few feet of the house, including mulch, wood chip landscaping, and moist ground cover. Inspect for and eliminate moist areas near the exterior of the home where centipedes or millipedes may be living. Store firewood away from the house and inspect for clinging bugs and insects prior to bringing into the home. Seal around doors and windows, particularly those that are low to the ground. Apply an insecticide labeled for this use around the foundation, about two feet up the outside walls, and one to two feet out from the home. Follow all label directions when using any pesticide. If found in the house, simply vacuum or sweep up, squashing and discarding or releasing the arthropods outside.